I used to be the grumpiest shopper in town, no matter what town I happened to be in at the time. I hated going to the shops to buy clothes, shoes, household goods or anything else, really. Although, I am not sure quite when and why this aversion to the stores started. All I know is that I am so glad that the internet came along to save me and my business from having to do it anymore. By taking my business online I can sell whatever I want, when I want. Even better news came with the latest generation of internet auction software. 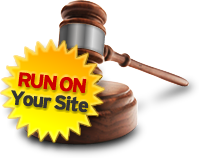 Selling your assets in an online auction is so much more exciting than doing it from a store. I now class it as one of my favourite hobbies and here are a few of the reasons why I like it so much. For example, the fast selling nature of an online auction. There are times in life when you want to know exactly what you are going to get. For example, when your light bulb blows out you want to go straight to somewhere which sells new ones. However, there are also times when I like to be taken by surprise. I enjoy watching my online auction site and seeing lots which I hadn’t even known anyone would be interested in. Bidders can come across some really interesting stuff this way. We all want to snap up a bargain every now and then, and why not? With the cost of living getting so high now it is only right that we look for smart purchases wherever we can. When I look around an internet online auctions I can usually find at least a couple of things which could possibly be really good buys if I get lucky. I think I know why I hate going to the real life shops so much after all; it is just so boring. There is nothing there which gets me excited in the way that an auction does. I really enjoy seeing new and exciting things but I also love the thrills and spills of the auction atmosphere. There is nothing quite like putting down a good bid and then waiting to see if you will get what you want for the price you want to pay. Still, even if you don’t get what it this time there will always be another lot to bid for soon. The benefits of the most modern auction software are clear for all to see. They can help keep your customers happy and grow your brand at the same time.